Russian investigators believe a malfunction during separation of the Soyuz rocket’s four liquid-fueled first stage boosters two minutes after liftoff from Kazakhstan led to an emergency landing of a two-man crew heading for the International Space Station, officials said Friday. Speaking to reporters Friday in Moscow, veteran cosmonaut Sergei Krikalev, head of the Russian space agency’s human spaceflight program, said the investigation into Thursday’s launch failure has narrowed on a collision between part of the Soyuz rocket’s first stage and the launcher’s second stage. 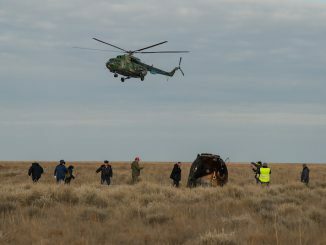 Russian cosmonaut Alexey Ovchinin and NASA astronaut Nick Hague were carried away from the failing rocket by an emergency escape system, and they safely landed inside their descent module near Dzhezkazgan, Kazakhstan, around 250 miles (400 kilometers) northeast of the Baikonur Cosmodrome, where the launch originated. The Soyuz first stage is comprised of four boosters, each powered by a four-nozzle kerosene-fueled RD-107A main engine, that burn for 1 minute, 58 seconds, during launch. Once their engine firings are complete, the boosters are supposed to jettison simultaneously at an altitude of roughly 150,000 feet (45 kilometers) to tumble back to Earth. Krikalev said Friday that one of the boosters did not separate from the Soyuz core stage — or second stage — cleanly. “There was a collision with one of the side sections, which is part of the first stage. During the separation, the first and second stages came into contact,” Krikalev said, according to a report published by ABC News. The boosters have a pusher system to propel the spent rocket segments away from the Soyuz core stage, which was supposed to continue firing to send Ovchinin and Hague into orbit in pursuit of the International Space Station. 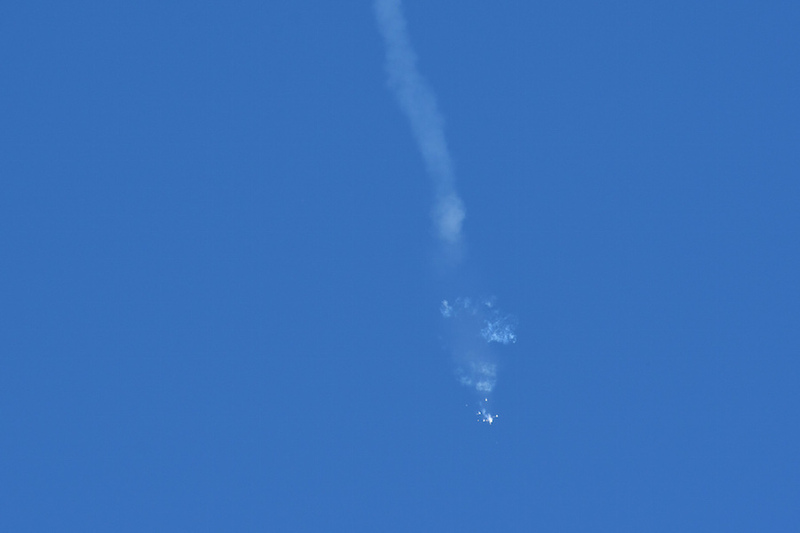 The collision damaged the lower part of the Soyuz rocket’s core stage, prompting the Soyuz MS-10 spacecraft to automatically trigger an abort. Rocket thrusters outside the Soyuz capsule’s shroud at the nose of the rocket rapidly propelled the crew away from launch vehicle, which appeared to disintegrate in video recordings taken from the Baikonur Cosmodrome. The failure occurred seconds after the needle-shaped launch abort tower jettisoned from the rocket as part of the normal Soyuz launch sequence, leaving rocket motors located on the spacecraft’s shell to push the crew to safety. 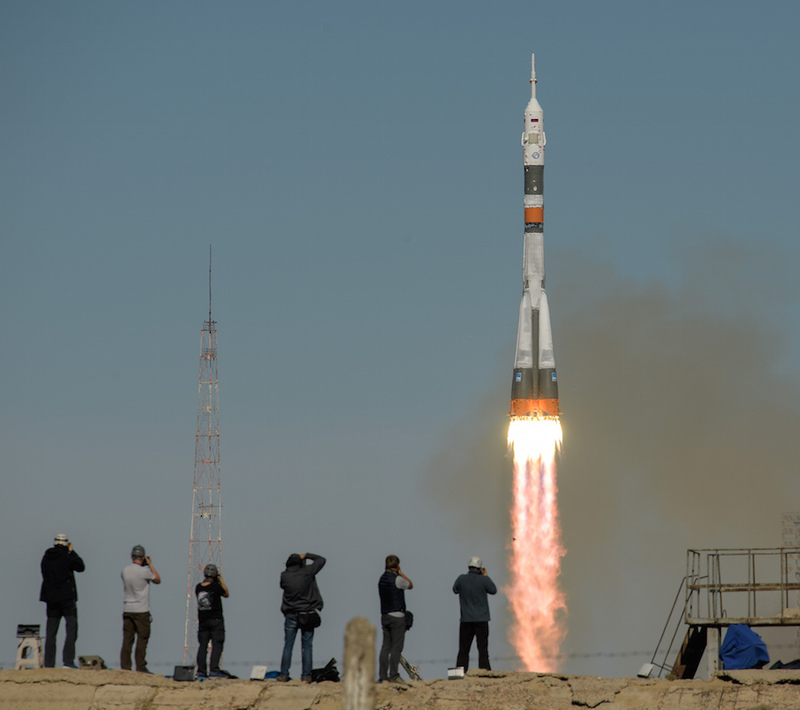 Imagery captured by NASA photographer Bill Ingalls from the Baikonur launch base appeared to show only three of the four first stage boosters fall away from the Soyuz rocket. Moments later, a cloud of vapor and debris appeared. Thursday’s emergency landing was the first in-flight abort during a Soyuz crew launch since 1975. Another Russian crew used the abort system to escape a rocket explosion on the launch pad at Baikonur in 1983. While Russian satellite launches and resupply missions to the space station have suffered failures in recent years, Soyuz crew launches proceeded without issue until Thursday’s flight. 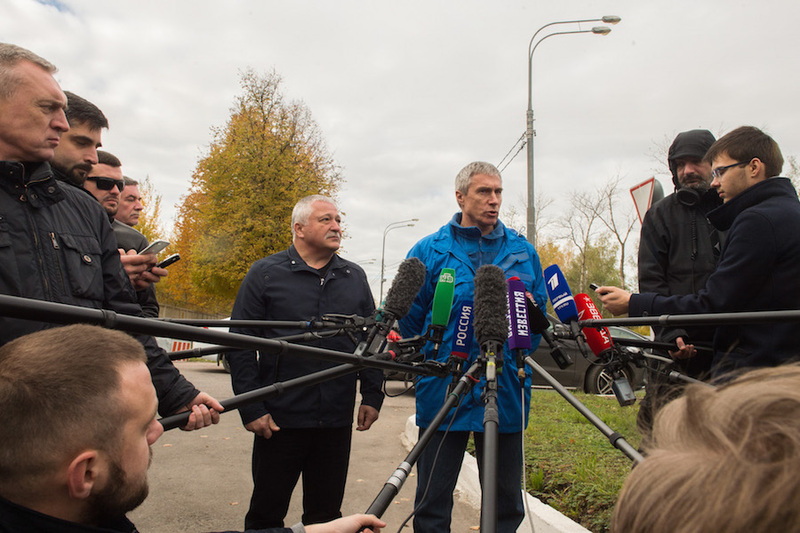 Krikalev said investigators are still studying the cause of Thursday’s booster separation malfunction, and results of the Russian state commission inquiry are expected after Oct. 20. The video below shows the four boosters separating from a Soyuz rocket on a previous launch, including a view from an on-board camera. Before Thursday’s launch accident, a Soyuz rocket was scheduled to lift off Oct. 31 from Baikonur with an unpiloted Progress resupply and refueling freighter for the space station. The next space station crew was supposed to launch Dec. 20, again on a Soyuz rocket. 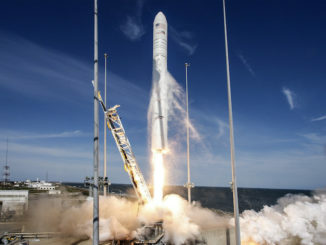 The launch dates for those missions are now uncertain, and Russian officials have said crewed launches to the station are suspended until the investigation finds the cause of Thursday’s failure. But with Russia’s decision to fast-track preparations on the next Soyuz launcher, there’s a chance officials could identify and resolve the problem that caused Thursday’s abort without significant impacts to the station’s launch schedule. 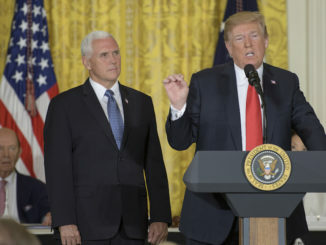 NASA Administrator Jim Bridenstine said Friday in Moscow that he had no reason to believe the December crew launch will be delayed. A three-person crew remains aboard the space station, led by Expedition 57 commander Alexander Gerst — a German astronaut representing the European Space Agency — who is living on the orbiting research complex alongside Russian cosmonaut Sergey Prokopyev and NASA flight engineer Serena Auñón-Chancellor. Gerst’s crew launched June 6 on the Soyuz MS-09 spacecraft, and were due to return to Earth on Dec. 13, leaving Ovchinin and Hague on the station until the launch of cosmonaut Oleg Kononenko, NASA astronaut Anne McClain and Canadian astronaut David Saint-Jacques on the Soyuz MS-11 capsule Dec. 20. 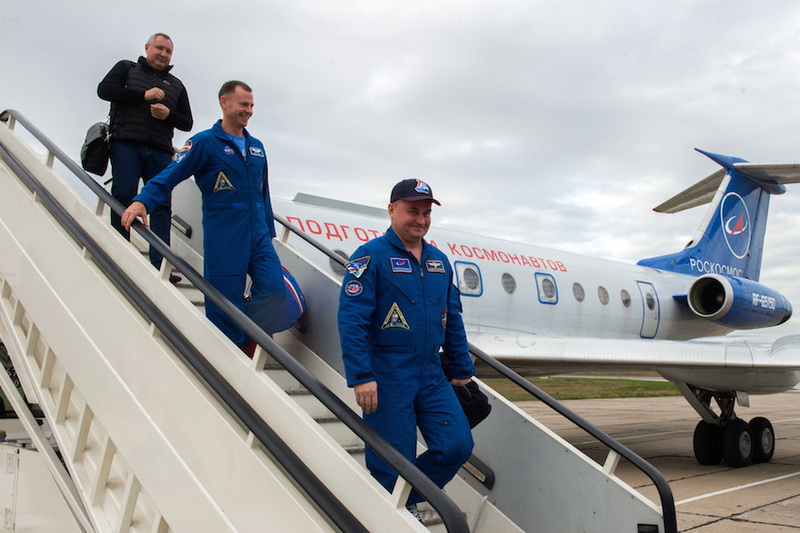 The Soyuz MS-09 spacecraft flown by Gerst, Prokopyev and Auñón-Chancellor has a design life of around 200 days, and the vehicle’s scheduled departure and return could be pushed back from mid-December to early January. There is also the possibility for Russia to send a Soyuz spacecraft to the space station without a crew later this year, flying in a fully automated mode that Russian engineers already planned to use on a test flight next year. That would allow Gerst and his crewmates to stay aboard the station months into 2019, and still have a certified Soyuz landing craft available to bring them home. Kenny Todd, NASA’s space station operations integration manager, said in a media briefing Thursday that officials will assess the status of Russia’s investigation into the launch failure before any decisions about future missions, or whether the station will have to be temporarily left without a crew. In a worst-case scenario, Todd said he is confident the space station can safely operate for a “significant amount of time” without a crew on-board. “The systems are certainly designed, if they can continue to operate and the pumps do their job and … the arrays continue to rotate, and we can keep the batteries charged, yeah, there’s nothing that says we can’t just continue to (orbit) and do a minimal amount of commanding,” Todd said. “I’m not too concerned about that as long as our systems continue to operate at the level they’re at now. One area where the space station does not have redundancy is in crew transportation. Russian Soyuz capsules are the only vehicles in service capable of ferrying crews to and from the space station. NASA managers hope that will change next year, when commercial capsules built by Boeing and SpaceX conduct test flights — first one without any astronauts, and then a crewed demo mission — before beginning regular crew rotation launches at a pace of two-to-three missions per year. But the start of commercial crew services has been delayed, and NASA recently said neither capsule would be ready for an initial unpiloted orbital test flight by the end of the year. SpaceX’s Crew Dragon spacecraft is now scheduled for its first test flight with astronauts in June 2019, and Boeing’s CST-100 Starliner is due for its maiden demo mission with a three-person crew in August. Those schedules remain ambitious, according to a panel of NASA safety advisors, who said Thursday that both companies must resolve multiple technical issues, including problems with parachutes, before proceeding with a crewed test flight. If Thursday’s launch went according to plan, Ovchinin and Hague planned to stay in orbit until April on a six-month space station expedition. Dmitry Rogozin, the head of Roscosmos, tweeted Friday that officials plan to launch the two-man team on another mission in the spring of 2019. Space station crews have already been assigned to missions in 2019, so it was not immediately clear how the expedition assignments might be altered if Ovchinin and Hague launch again next year. Thursday’s launch was to be the start of Ovchinin’s second trip to space, and Hague’s first.